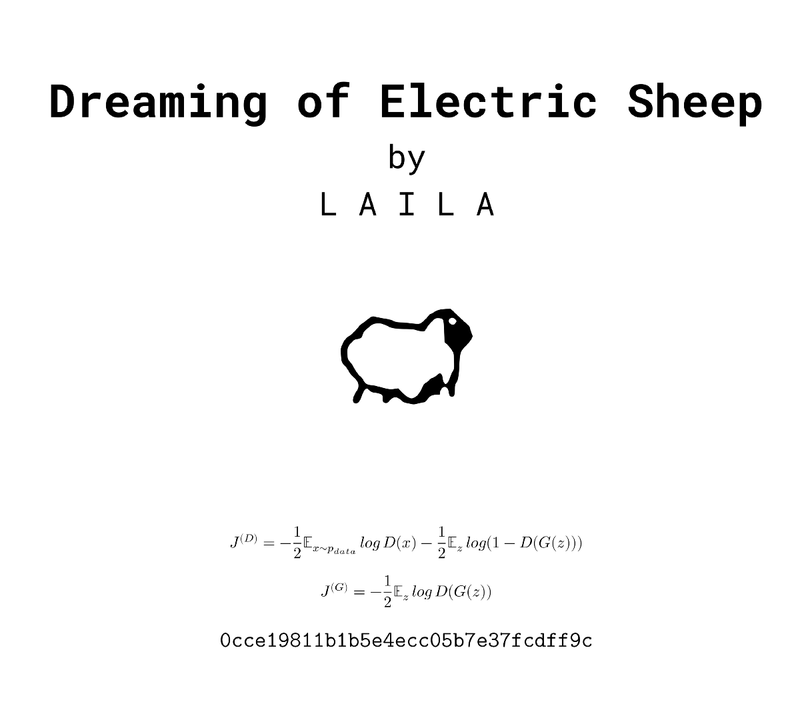 We are excited to announce that the book “Dreaming of Electric Sheep” is available at Amazon. All royalties will be used to support our initiatives on AI/ML literacy. 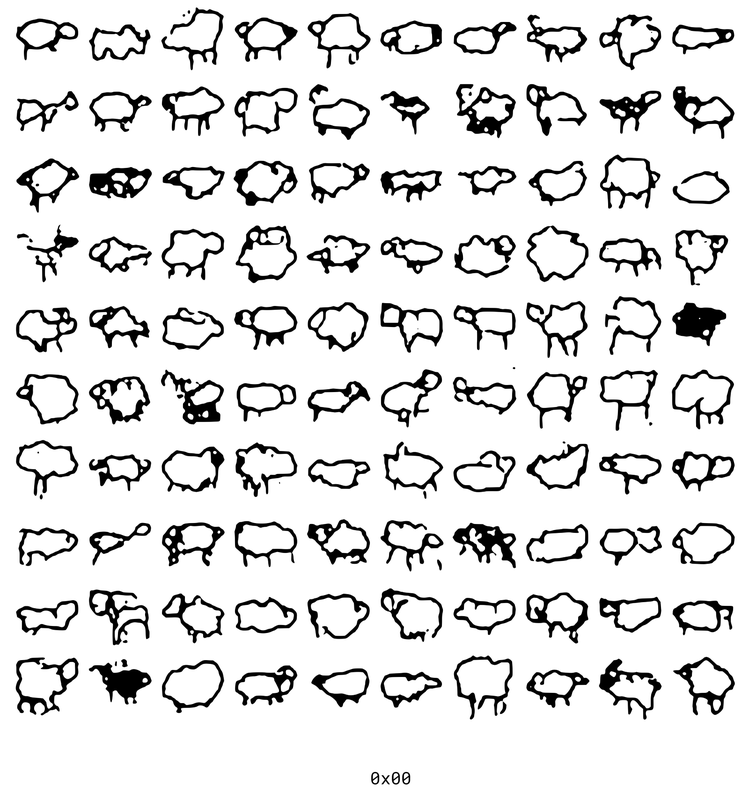 The book contains 10000 sheep drawn by Artificial Intelligence based on Machine Learning (AI/ML). More than 12 years ago, Amazon coined the term artificial artificial intelligence for processes outsourcing tasks to humans, especially those tasks computers are (or were?) lousy at, e.g., identifying objects in a photograph, writing short product reviews, transcribing podcasts, watching a short film and then describing the emotions it elicits. Crowdsourcing emerged as a new form of labor on demand  and Amazon Mechanical Turk (MTurk) provided the mechanisms to harness the power of a global workforce to complete tasks at scale. It was in this context where Aaron Koblin’s project, The Sheep Market, was born. Back to 2018, AI/ML is currently showing impressive performance in fields such as computer vision and natural language processing. AI/ML is expected to impact many industries, helping us in our tedious tasks or taking our jobs, or something in between. This book is an experiment that illustrates how certain crowdsourced tasks, e.g., drawing a sheep using MTurk’s artificial artificial intelligence HITs, can now be completed by machines achieving close to human level performance, which potentially could start taking away those micro-payments from human workers. Workers that, paradoxically, have helped machines to learn from the datasets created by completing micro tasks. For example, in creating this book the machine, an AI/ML model, is trained using a dataset of sheep sketches crowdsourced from real people  and then is able to generate original sheep drawings on its own. How to teach a machine to draw (electric) sheep? We humans are imperfectly ingenious sketching sheep, remember The Sheep Market project? or have a look to some of the tens of thousands sheep doodles made by real people in The Quick, Draw! experiment. “… if every person drew a perfect sheep they would all be the same and it would be a horrible project … it’s the little variations that give the character and make it interesting.” — Aaron Koblin, The Sheep Market project. 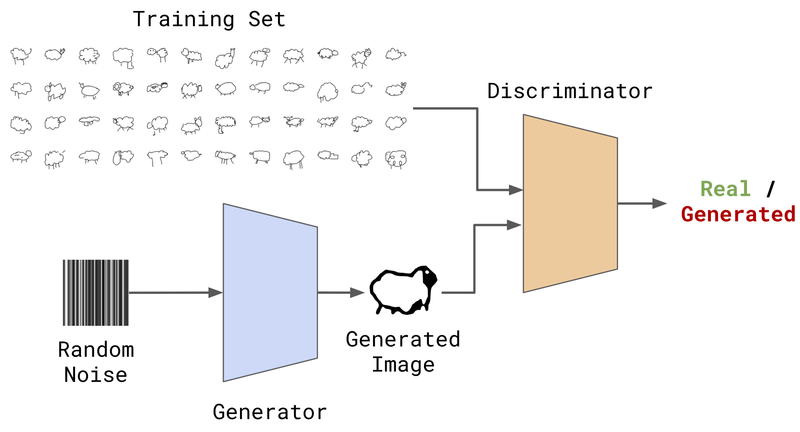 All such variants and diversity humans express when sketching a sheep would be extremely difficult to capture in a program written in Python, Java, or C++. AI/ML to the rescue. If you want to teach the machine to draw a sheep using AI/ML, you won’t tell it to draw the head, then the body with fleece, the face, and eyes. You will simply show it thousands and thousands of drawings of sheep, and eventually the machine will learn and work things out. If it keeps failing, you don’t rewrite the code. You just keep training it. Why, why, why are we doing this? More sheep than people living in Ireland. What do you do with a book containing 10000 electric sheep? We use an AI/ML algorithm named Generative Adversarial Networks (GAN) . GANs are implemented by a system of two deep neural networks contesting with each other in a zero-sum game framework. The two players in the game are called Generator and Discriminator. The Generator, as its name implies, generates candidates and the Discriminator evaluates them. The generative network’s training goal is to produce novel synthesized instances that appear to have come from the set of real instances, whereas for the discriminator, its goal is differentiating between true and generated instances. You can think of an art analogy of an apprentice-master relationship, where from an empty canvas, the apprentice (Generator) will produce paintings that the master (Discriminator) will judge based on her experience and previous knowledge as real pieces of art or not. The apprentice will get better and better based on the master’s feedback, until reaching a level where the master will not be able to discriminate between her apprentice’s work and a good piece of art. Drawing Electric Sheep with a DCGAN. The Dataset. As training set we use the sheep dataset from The Quick, Draw! experiment. Architecture. We use a Deep Convolutional Generative Adversarial Networks or DCGAN  to implement our approach. Deep Learning Tools. We use Keras with TensorFlow backend for the model implementation and JupyterLab for prototyping. Models. After the Generator and Discriminator models are trained, we save them independently. In the paper A Neural Representation of Sketch Drawings,by David Ha and Douglas Eck (2017). https://arxiv.org/abs/1704.03477 , a recurrent neural network (RNN) is used to construct drawings based on path strokes and not pixels. We instead used a GANs, since we think it helps the explanation based on the analogy of apprentice-master. Our model uses pixel-level information for the images for training and for generating new instances. In order to improve the image quality, we convert the output bitmaps into vector graphics (SVG) using Potrace. Quick, Draw! Sheep Dataset. 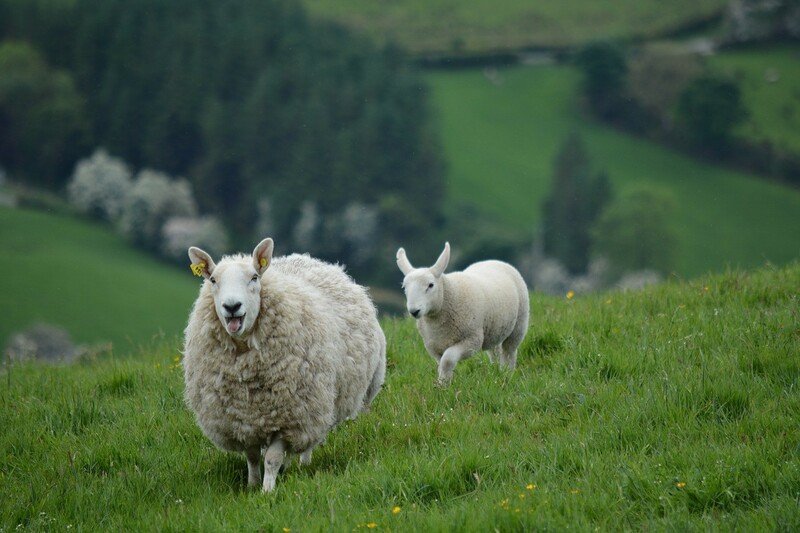 https://quickdraw.withgoogle.com/data/sheep ; data made available by Google, Inc. under the Creative Commons Attribution 4.0 International license. Jeff Howe. 2016. The Rise of Crowdsourcing. [https://www.wired.com/2006/06/crowds/]. Our mission is to widely disseminate the benefits of Artificial Intelligence and Machine Learning and make them accessible to the world. Our mission is to widely disseminate the benefits of Artificial Intelligence (AI) and Machine Learning (ML) and make them accessible to the world.